Approach Me, Inc. owns and operates: Briskly, Briskly Biz, TrackerX, PointX, PointX Pro, ApproachMe, Approachable, Get Here, Eat Here, DirectoryX, eOpen, Lighthouse-X, Rio and Find Each Other. ("APPROACH ME") or ("We") owns and operates this Website and relating Apps. This document governs your relationship with APPROACH ME Access to and use of this Website, the App, and the products and services available through this Website and App (collectively, the "Services") are subject to the following terms, conditions and notices (the "Terms of Service"). We often refer to ("this site") which refers to the website, the apps associated with this website, including Briskly, Briskly Biz, TrackerX, PointX, PointX Pro, ApproachMe, Approachable, Get Here, Eat Here, DirectoryX, eOpen, Lighthouse-X, Rio, and Find Each Other Apps. By using the Services you are agreeing to all of the Terms of Service, as may be updated by us from time to time. You should check this page regularly to take notice of any changes we may have made to the Terms of Service. We want to welcome you to our online Website, and our Apps. APPROACH ME provides our services to you, subject to the following conditions. If you visit or shop within APPROACH ME, you accept and agree to adhere to these conditions. Please read them carefully and contact us with any questions. When you visit APPROACH ME, send e-mails to us or use our communication method of the app, you are communicating with us electronically. You consent to receive communications from us electronically. We will communicate with you by e-mail, push notifications, texts or by posting notices on this site. You agree that all agreements, notices, disclosures, invoices, and other communications that we provide to you electronically, satisfy any legal requirement that such communications be in writing. All content and apps included on this site, such as text, graphics, logos, button icons, images, audio clips, digital downloads, data compilations, and software, is the property of APPROACH ME or its content suppliers and protected by international copyright laws. The compilation of all content on this site is the exclusive property of APPROACH ME, with copyright authorship for this collection by APPROACH ME and protected by international copyright laws. APPROACH ME's trademarks may not be used in connection with any product or service that is not affiliated with APPROACH ME in any manner that is likely to cause confusion among customers, or in any manner that disparages or discredits APPROACH ME. All other trademarks not owned by APPROACH ME, or its subsidiaries that appear on this site are the property of their respective owners, who may or may not be affiliated with, connected to, or sponsored by APPROACH ME or its subsidiaries. APPROACH ME grants you a limited license to access and make personal use of this site. You may not download (other than page caching), modify it, or any portion of it except with express written consent of APPROACH ME. This license does not include any resale or commercial use of this site or its contents; any collection and use of any product listings, descriptions, or prices; any derivative use of this site or its contents; any downloading or copying of account information for the benefit of another merchant; any use of data mining, robots, or similar data gathering and extraction tools. This site or any portion of this site may not be reproduced, duplicated, copied, sold, resold, visited, or otherwise exploited for any commercial purposes without express written consent of APPROACH ME. You may not frame or utilize framing techniques to enclose any trademark, logo, or other proprietary information (including images, text, page layout, or form) of APPROACH ME and our associates without expressed written consent. You may not use any meta tags or any other "hidden text" utilizing APPROACH ME's name or trademarks without the expressed written consent of APPROACH ME. Any unauthorized use terminates the permission or license granted by APPROACH ME. You are granted a limited, revocable, and nonexclusive right to create a hyperlink to the home page of APPROACH ME so long as the link does not portray APPROACH ME, its associates, or their products or services in a false, misleading, derogatory, or otherwise offensive matter. You may not use any logo from APPROACH ME or other proprietary graphic or trademark as part of the link without expressed written permission. If you use this site, you are responsible for maintaining the confidentiality of your account and password, for restricting access to your computer or your mobile devices, and agree to accept responsibility for all activities that occur under your account or password. If you are under 18, you may use our website only with involvement of a parent or guardian. APPROACH ME and its associates reserve the right to refuse service, terminate accounts, remove or edit content, or cancel orders at their sole discretion. APPROACH ME does not solicit any kind of ideas or suggestions relating to new features or to improve the Services, enhancements, plans, marketing, operational or technical suggestions (“Unsolicited Suggestions”). Please do not send any such Unsolicited Suggestions to any member or system of APPROACH ME. If Unsolicited Suggestions are sent by you, received by APPROACH ME, or shared by you with APPROACH ME in any form or shape, you agree that APPROACH ME will have the full ownership of the Unsolicited Suggestions to use, review, adapt, publish, translate, create derivative works from, display, keep, delete, distribute, disclose and/or modify, in any shape or form, without any compensation to you, and without any restrictions, obligations or to acknowledge or notify you. If you do not agree with this statement please do not send any kind of Unsolicited Ideas. Other than Unsolicited Suggestions listed above, Visitors may post reviews, comments, and other content, and submit questions, or other information, so long as the content is not illegal, obscene, threatening, defamatory, invasive of privacy, infringing upon intellectual property rights, or otherwise injurious or objectionable to third parties, and does not consist of, or contain software viruses, political campaigning, commercial solicitation, chain letters, mass mailings, or any form of “spam.” You may not use a false e-mail address, impersonate any person or entity, or otherwise mislead as to the origin content. APPROACH ME reserves the right (but not the obligation) to remove or edit such content, but does not regularly review posted content. If you do post content or submit material, and unless We indicate otherwise, you grant APPROACH ME and its associates a nonexclusive, royalty-free, perpetual, irrevocable, and fully sub licensable right to use, reproduce, modify, adapt, publish, translate, create derivative works from, distribute, and display such content throughout the world in any media. You grant APPROACH ME and its associates and sub licensees the right to use the name that you submit in connection with such content, if We choose. You represent and warrant that you own or otherwise control all of the rights to the content that you post, that the content is accurate, that use of the content you supply does not violate this policy and will not cause injury to any person or entity, and that you will indemnify APPROACH ME or any of it’s associates for all claims resulting from content you supply. APPROACH ME has the right, but not the obligation, to monitor and edit or remove any activity or content. APPROACH ME takes no responsibility and assumes no liability for any content posted by you or any third party. All Services and items purchased from APPROACH ME are made pursuant to a shipment contract. This means that the risk of loss and title for such items pass to you upon our delivery to the carrier. If an item purchased through our site was not received, meaning you have reported it not received, and there was no proof of delivery, we will at our own discretion send another item or refund you the purchase price. While we endeavor to keep the information up to date and correct, we make no representations or warranties of any kind, express or implied, about the completeness, accuracy, reliability, suitability or availability with respect to the Website and the App or the information, products, services, or related graphics contained on the App for any purpose. Any reliance you place on such information is therefore strictly at your own risk. Please note that APPROACH ME, website and our App and the information rendered is highly dependent on many outside factors including but limited to, the availability of cellular service, the availability of an internet connection and their respective signal strengths. Our program includes the additional utilization of the compass built or used by your mobile device, and highly relies on GPS signal. Thus, any inaccuracies or unavailability of any of the above could result in error in the output and may affect the reliability of the direction, distance, location and positioning of users, destinations, APPROACH MEs and mobile devices. Please use at your own risk. You agree not to hold APPROACH ME or any of its associates, affiliates or any of its direct or indirect partners harmless from any liability of any kind. If you do not agree to these terms, please do not use APPROACH ME and return it unused for a full refund. In no event will we be liable for any loss or damage INCLUDING, BUT NOT LIMITED TO DIRECT, INDIRECT, INCIDENTAL, PUNITIVE, AND CONSEQUENTIAL DAMAGES., or any loss or damage whatsoever arising reliance on the use of APPROACH ME, the website, and/or the app or its accuracy. You agree that our maximum liability in any case is limited to the price paid to APPROACH ME for the unit purchased from APPROACH ME. Every Briskly Deal is valid from the time its viewed until the expiration time indicated on the offer, unless all available quantities are sold out. The only way to insure the offer is available during the time window of the offer is to select to Grab Deal it. If the offer is On Hold, the time to redeem the offer (Timer) will be activated and display the time remaining to reach the business offer location. The Timer will be set based on the distance to the business offer location and the location in which the offer was On Hold. The Redeem option will be available upon arrival of the business offer location. Redeeming the offer must be completed before the time expiration. The offer will no longer be valid after the offer timer expires. The Briskly Deal is valid only for the specific item or service indicated in the title and description. It is not valid for any other products or services. Only one Briskly Deal per customer prior to redeeming the offer. Each offer has a specified quantity limit per customer. Customers can Grab Deal at maximum the quantity limit indicated in the offer. May not be used in combination with any other coupons or promotions. Quantities are limited. Every Briskly Deal will indicate the maximum quantity available at the offer price. Each Briskly Deal has a unique QR Code associated with it that may not be duplicated or copied. Once redeemed and scanned by the business, the associated QR Code will no longer be valid. Mobile displayed offers only will be accepted, and must be presented from the Briskly Mobile App with the QR Code associated with that offer displayed to be scanned by the business upon redemption. Once the customer has reached the business, the Redeem option will be visible. Once selected the QR code will be available to be scanned by the business and realize the savings. No additional fees or costs if the Briskly Deal is Redeemed at the business offer location. Any additional items or services not associated with the Briskly Deal will need to be paid separately. Sales tax in not included in the Briskly Deal price. 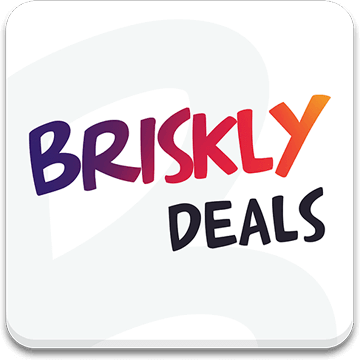 This App, Briskly and Briskly Biz are a platform for businesses to briskly deals to customers, and for customers to view and possibly act on these offers. All content of the offers such as quality of goods and services and the manner of which they represent and redeem them is the sole responsibility of the businesses which posted them. Briskly assumes no liability for any business or customer contents. In no event shall Briskly be liable for any direct, indirect, punitive, incidental, special consequential damages, to property or life, whatsoever arising out of or connected with the use or misuse of the App. All of the information provided on this website and relating Apps is provided "AS-IS" and with NO WARRANTIES. No express or implied warranties of any type, including for example implied warranties of merchantability or fitness for a particular purpose are made with respect to the information, or any use of the information on this site. APPROACH ME makes no representations and extends no warranties of any type as to the accuracy or completeness of any information or content on this App. APPROACH ME specifically DISCLAIMS LIABILITY FOR INCIDENTAL OR CONSEQUENTIAL DAMAGES and assumes no responsibility or liability for any loss or damage suffered by any person as a result of the use or misuse of any of the information or content on this App. APPROACH ME assumes or undertakes NO LIABILITY for any loss or damage suffered as a result of the use, misuse or reliance on the information and content on the App. APPROACH ME's maximum liability is limited to the actual fee charged to the business for the specific item or services redeemed. If you do not agree with these terms and conditions, please do not use the App to view, Grab Deal or Redeem any offers. Every effort is made to keep the Service and the Site up and running smoothly. However, ApproachMe takes no responsibility for, and will not be liable for, the Service being temporarily unavailable due to technical issues beyond our control. APPROACH ME and its associates attempt to be as accurate as possible. However, APPROACH ME does not warrant that product descriptions or other content of this site is accurate, complete, reliable, current, or error-free. If Service by APPROACH ME is not as described, your sole remedy is to return it for a full refund of the purchased price. THE SERVICE AND THE SITE IS PROVIDED BY APPROACH ME ON AN "AS IS" AND "AS AVAILABLE" BASIS. APPROACH ME MAKES NO REPRESENTATIONS OR WARRANTIES OF ANY KIND, EXPRESS OR IMPLIED, AS TO THE OPERATION OF THE SERVICE, THE SITE, OR THE INFORMATION, CONTENT, MATERIALS, OR PRODUCTS INCLUDED ON THIS SITE. YOU EXPRESSLY AGREE THAT YOUR USE OF THIS SITE IS AT YOUR SOLE RISK. TO THE FULL EXTENT PERMISSIBLE BY APPLICABLE LAW, APPROACH ME DISCLAIMS ALL WARRANTIES, EXPRESS OR IMPLIED, INCLUDING, BUT NOT LIMITED TO, IMPLIED WARRANTIES OF MERCHANTABILITY AND FITNESS FOR A PARTICULAR PURPOSE. APPROACH ME DOES NOT WARRANT THAT THIS SITE, ITS SERVERS, OR E-MAIL SENT FROM APPROACH ME ARE FREE OF VIRUSES OR OTHER HARMFUL COMPONENTS. APPROACH ME WILL NOT BE LIABLE FOR ANY DAMAGES OF ANY KIND ARISING FROM THE USE OF THIS SITE, INCLUDING, BUT NOT LIMITED TO DIRECT, INDIRECT, INCIDENTAL, PUNITIVE, AND CONSEQUENTIAL DAMAGES. CERTAIN STATE LAWS DO NOT ALLOW LIMITATIONS ON IMPLIED WARRANTIES OR THE EXCLUSION OR LIMITATION OF CERTAIN DAMAGES. IF THESE LAWS APPLY TO YOU, SOME OR ALL OF THE ABOVE DISCLAIMERS, EXCLUSIONS, OR LIMITATIONS MAY NOT APPLY TO YOU, AND YOU MIGHT HAVE ADDITIONAL RIGHTS. You agree to indemnify, defend, and hold harmless Approach Me® , Inc., its Affiliates and their respective, directors, employees, and agents from and against any claims asserted by any third party arising out of or due to: (i) Your Data; (ii) Your (or Your User's) breach of this Agreement; (iii) Your (or Your User's) use of the Services, Software, or Documentation in violation of third party rights, including any intellectual property rights, or any applicable laws, or (iv) Your (or Your User's) misuse of the Services, Software, or Documentation. Approach Me®, Inc. and all its applications and services are provided to you "AS IS", without any warranty or guarantee of any kind, either expressed or implied. You agree to hold harmless Approach Me®, Inc. and all its officers, directors, agents, employees, contractors, shareholders, stakeholders, suppliers, providers, users, customers and affiliates worldwide, from any liability of any kind. If you do not agree to these terms, please remove the App and do not use. By visiting APPROACH ME, you agree that the laws of the State of California, USA, without regard to principles of conflict of laws, will govern these Conditions of Use and disputes of any sort that might arise between you and APPROACH ME or its associates. Any dispute relating in any way to your visit to APPROACH ME or to products you purchase through APPROACH ME shall be submitted to confidential arbitration in the County of Santa Clara, State of California, USA, except that, to the extent you have in any manner violated or threatened to violate APPROACH ME's intellectual property rights, APPROACH ME may seek injunctive or other appropriate relief in any state or federal court in the state of State of California, USA, and you consent to exclusive jurisdiction and venue in such courts. Arbitration under this agreement shall be conducted under the rules then prevailing of the American Arbitration Association. The arbitrator's award shall be binding and may be entered as a judgment in any court of competent jurisdiction. To the fullest extent permitted by applicable law, no arbitration under this Agreement shall be joined to an arbitration involving any other party subject to this Agreement, whether through class arbitration proceedings or otherwise. Please review our other policies on this site. These policies also govern your visit to APPROACH ME. We reserve the right to make changes to our site, policies, and these Conditions of Use at any time without notice. If any of these conditions shall be deemed invalid, void, or for any reason unenforceable, that condition shall be deemed severable and shall not affect the validity and enforceability of any remaining condition.